For bodies with atmospheres, the landing occurs after atmospheric entry. In these cases, landers may employ parachutes to slow down and to maintain a low terminal velocity. Sometimes small landing rockets are fired just before impact to reduce the impact velocity. Landing may be accomplished by controlled descent and setdown on landing gear, with the possible addition of a post-landing attachment mechanism for celestial bodies with low gravity. Some missions (for example, Luna 9 and Mars Pathfinder), used inflatable airbags to cushion the lander's impact rather than a more traditional landing gear. When a high velocity impact is planned not for just achieving the surface but for study of consequences of impact, the spacecraft is called an impactor. Several terrestrial bodies have been subject of lander or impactor exploration: among them Earth's Moon, the planets Venus, Mars, and Mercury, the Saturn moon Titan, the asteroids and comets. Beginning with Luna 2 in 1959, the first few spacecraft to reach the lunar surface were impactors, not landers. They were part of the Soviet Luna program or the American Ranger program. In 1966, the Soviet Luna 9 became the first spacecraft to achieve a lunar soft landing and to transmit photographic data to Earth. The American Surveyor program (since 1966) was designed to determine where Apollo could land safely. As a result, these robotic missions required soft landers to sample the lunar soil and determine the thickness of the dust layer, which was unknown before Surveyor. The U.S. manned Apollo Lunar Modules (since 1969) with rovers (since 1971) and Soviet unmanned late big landers (since 1969), Lunokhods (since 1970) and sample return missions (since 1970) used a rocket descent engine for a soft landing of astronauts and lunar rovers on the Moon. The Altair spacecraft, previously known as the "Lunar Surface Access Module" or "LSAM", was the planned lander for the Constellation program, prior to the cancellation of Project Constellation. As of August 2012[update] NASA is developing vehicles that use a rocket descent engine permitting them land on the Moon and other locations. These vehicles include the Mighty Eagle lander and the Morpheus lander. The Project Morpheus lander may have sufficient thrust to propel a manned ascent stage. Russia has plans for Luna-Grunt mission to return samples from the Moon by 2021. The Chinese Chang'e 3 mission and its Jade Rabbit rover landed on 14 December 2013. Then China plans to repeat lander with rover in Chang'e 4 mission after 2015 that will followed by Chang'e 5 and Chang'e 6 sample return missions in 2017 and before 2020. The Soviet Venera program included a number of Venus landers, some of which were crushed during descent much as Galileo's Jupiter "lander" and others of which successfully touched down. Venera 3 in 1966 and Venera 7 in 1970 became the first impact and soft landing on Venus. The Soviet Vega program also placed in 1985 two balloons in the Venusian atmosphere, they were the first aerial tools on other planets. The Soviet Union's Mars 1962B was the first Earth based mission intended to reach the surface as impact on Mars in 1962. In 1971, the lander of the Mars 3 probe conducted the first soft landing on Mars, but communication was lost within a minute after touchdown, which occurred during one of the worst global dust storms since the beginning of telescopic observations of the Red Planet. Three other landers, Mars 2 in 1971 and Mars 5, Mars 6 in 1973, either crashed or failed to even enter the planet's atmosphere. All four landers used an aeroshell-like heat shield during atmospheric entry. Mars 2 and Mars 3 landers carried the first small skis-walking Martian rovers that did not work on the planet. The Soviet Union planned the heavy Marsokhod Mars 4NM mission (in 1973) Mars sample return Mars 5NM mission (in 1975) but they did not occur due to need of the N1 superlauncher that was never flown successfully. A double-launching Soviet Mars 5M (Mars-79) sample return mission was planned for 1979 but cancelled due to complexity and technical problems. Viking 1 and 2 were launched respectively in August and September 1975, each comprising an orbiter vehicle and a lander. Viking 1 landed in July 1976 and Viking 2 in September 1976. The Viking rovers were the first successful, working Mars landers. The mission ended in May 1983, after both landers had died. In the 1970s, the US planned the Voyager-Mars mission. This would have consisted of two orbiters and two landers, launched by a single Saturn V rocket, but the mission was cancelled. Mars 96 was the first complex post-Soviet Russian mission with an orbiter, lander and penetrators. Planned for 1996, it failed at launch. A planned repeat of this mission, Mars 98, was cancelled due to lack of funding. The U.S. Mars Pathfinder was launched in December 1996 and released the first acting rover on Mars, named Sojourner, in July 1997. It failed in September 1997, probably due to electronics failure caused by the cold temperatures. Mars Pathfinder was part of the cancelled Mars Environmental Survey program with a set of 16 landers planned for 1999–2009. The lander which brought the Spirit rover to the surface of Mars. The Mars Polar Lander ceased communication on 3 December 1999, prior to reaching the surface, and is presumed to have crashed. 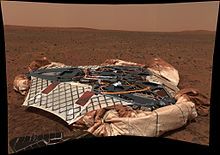 The European Beagle 2 lander deployed successfully from the Mars Express spacecraft but the signal confirming a landing which should have come on 25 December 2003 was not received. Indeed, no communication was ever established and Beagle 2 was declared lost on 6 February 2004. The proposed 2009 British Beagle 3 lander mission to search for life, past or present was not adopted. The French/ESA NetLander mission for 2007 or 2009, with an orbiter and 4 landers, was cancelled because it was too expensive. Its successor, Mars MetNet, a multi-lander mission for 2011–2019 was not adopted by the ESA. The American Mars Exploration Rovers Spirit and Opportunity were launched in June and July 2003. They reached the Martian surface in January 2004 using landers featuring airbags and parachutes to soften impact. Spirit ceased functioning in 2010, more than five years past its design lifetime. As of February 13, 2017, Opportunity was declared effectively dead, having exceeded its three-month design lifetime by well over a decade. The U.S. Phoenix spacecraft successfully achieved soft landing on the surface of Mars on May 25, 2008, using a combination of parachutes and rocket descent engines. Mars Science Laboratory (Curiosity) was successfully launched by NASA on November 26, 2011. It landed in the Aeolis Palus region of Gale Crater on Mars on August 6, 2012. Planned for 2018, NASA's Mars Astrobiology Explorer-Cacher lander mission was cancelled due to budget cuts. Exploration of Mars including the use of landers continues to this day. Amongst them, Russia has planned a Mars sample return mission Mars-Grunt for near 2026, and China for near 2030. While several flybys conducted by Mars orbiting probes have provided images and other data about the Martian moons Phobos and Deimos, only few of them intended to land on the surface of these satellites. Two probes under the Soviet Phobos program were successfully launched in 1988, but in 1989 the intended landings on Phobos and Deimos were not conducted due to failures in the spacecraft system. The post-Soviet Russian Fobos-Grunt probe was an intended sample return mission to Phobos in 2012 but failed after launch in 2011. In 2007 European Space Agency and EADS Astrium proposed and developed the mission to Phobos to 2016 with lander and sample return, but it stayed as project. Since 2007 the Canadian Space Agency considering the mission to Phobos PRIME (Phobos Reconnaissance and International Mars Exploration) with orbiter and lander. Recent proposals include a 2008 NASA Glenn Research Center Phobos and Deimos sample return mission, the 2013 Phobos Surveyor, and the OSIRIS-REx II mission concept. The Japanese Aerospace Exploration Agency (JAXA) plans to launch the Martian Moons Exploration (MMX) in 2024, a sample return mission targeting Phobos. MMX will land and collect samples from Phobos multiple times, along with deploying a rover jointly developed by CNES and DLR. By using a corer sampling mechanism, the spacecraft aims to retrieve a minimum 10 g amount of samples. MMX will return to Earth in 2029. Russia plans to repeat Fobos-Grunt mission near 2024. The Huygens probe, carried to Saturn's moon Titan by the Cassini, was specifically designed to survive landing on land and on liquid. It was thoroughly drop-tested to make sure it could withstand impact and continue functioning for at least three minutes. However, due to the low speed impact, it continued providing data for more than two hours after it landed. The landing on Titan in 2005 was the first landing on planet's satellites outside the Moon. The proposed U.S. TiME mission considered a lander that would splash down in a lake in Titan's northern hemisphere and float on the surface of the lake for few months. Spain's proposed TALISE mission is similar to TIME lander but has its own propulsion system for controlling shipping. Vesta, the multiaimed Soviet mission, developed in cooperation with European countries for realisation in 1991–1994 but canceled due to the Soviet Union disbanding, included the flyby of Mars with delivering the aerostat and small landers or penetrators followed by flybys of 1 Ceres or 4 Vesta and some other asteroids with impact of large penetrator on the one of them. NASA's cancelled Comet Rendezvous Asteroid Flyby mission considered the launch in 1995 and landing of penetrators on comet's nucleus in 2001. The first landing on a small Solar System body was performed in 2001 by the probe NEAR Shoemaker at asteroid 433 Eros despite the fact that NEAR was not originally designed to be capable of landing. The Hayabusa probe made several attempts to land on 25143 Itokawa in 2005 with mixed success, including a failed attempt to deploy a rover. It was the second lander on an asteroid and in 2010 the first sample return mission from an asteroid. The Rosetta probe, launched 2 March 2004, put the first robotic lander Philae on comet Churyumov–Gerasimenko on 12 November 2014. Due to the extremely low gravity of such bodies, the landing system included a harpoon launcher intended to anchor a cable in the surface and pull it down. Japan (JAXA) launched the Hayabusa 2 asteroid space probe in 2014 to deliver several landing parts (including Minerva II and German MASCOT (Mobile Asteroid Surface Scout) landers and SCI (Small Carry-on Impactor) penetrator) in 2018–2019 and to return samples to Earth by 2020. NASA launched the OSIRIS-REx sample return mission to asteroid 101955 Bennu in 2016. AIDA is a mission concept of ESA to investigate the effects of impact crashing a spacecraft into an asteroid. The Chinese Space Agency is designing a sample retrieval mission from Ceres that would take place during the 2020s. Launched in October 2018 and expected to reach Mercury in December 2025, ESA's BepiColombo mission to Mercury was originally designed to include the Mercury Surface Element (MSE). The lander would have carried a 7 kg payload consisting of an imaging system (a descent camera and a surface camera), a heat flow and physical properties package, an alpha particle X-ray spectrometer, a magnetometer, a seismometer, a soil penetrating device (mole), and a micro-rover. The MSE aspect of the mission was cancelled in 2003 due to budgetary constraints. A few Jupiter probes provides many images and other data about its moons. Some proposed missions with landing on Jupiter's moons were cancelled or no adopted. The small nuclear-powered Europa lander was proposed as part of NASA's JIMO mission that cancelled in 2006. Currently planning by ESA to launch in 2022 JUICE mission includes Russian Ganymede Lander on Ganymede that would make a soft landing near 2033. NASA proposed ESA to include a lander or impactor on Europa under Europa Clipper mission planning to launch in 2025. As Europa is very interesting and need to be investigate for habitability (by extraterrestrial life) and assess its astrobiological potential by confirming the existence and determining the characteristics of water within and below Europa's icy shell, despite of high radiation environment around itself and Jupiter troubling for any robotic surface mission, the Europa Lander Mission of NASA still considering and have led to steady lobbying for future missions. Russian Europa Lander was proposed to include as part of now cancelled joint NASA/ESA EJSM/Laplace mission and then stays planning for realisation in any other or separate mission. Also, another proposal calls for a large nuclear-powered "melt probe" (cryobot) that would melt through the ice until it reached an ocean below where it would deploy an autonomous underwater vehicle (hydrobot) that would gather information. The Deep Space 2 impactor probe was to be the first spacecraft to penetrate below the surface of another planet. However the mission failed with the loss of its mother ship, Mars Polar Lander after communication was lost after entry into Mars atmosphere on 3 December 1999. Comet Tempel 1 was visited by NASA's Deep Impact probe on 4 July 2005. The impact crater formed was approximately 200 m wide and 30–50 m deep, and detected the presence of silicates, carbonates, smectite, amorphous carbon and polycyclic aromatic hydrocarbons. The Moon Impact Probe (MIP) developed by the Indian Space Research Organisation (ISRO), India's national space agency, was a lunar probe that was released on 14 November 2008 by ISRO's Chandrayaan-1 lunar remote sensing orbiter which in turn was launched, on 22 October 2008. It discovered the presence of water on the Moon. 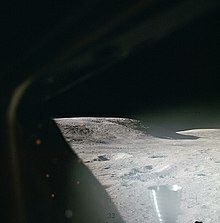 The Lunar Crater Observation and Sensing Satellite (LCROSS) was a robotic spacecraft operated by NASA to perform a lower-cost means of determining the nature of hydrogen detected at the polar regions of the moon. The main LCROSS mission objective was to explore the presence of water ice in a permanently shadowed crater near a lunar polar region. LCROSS was launched together with the Lunar Reconnaissance Orbiter (LRO) on 18 June 2009, as part of the shared Lunar Precursor Robotic Program. LCROSS was designed to collect and relay data from the impact and debris plume resulting from the launch vehicle's spent Centaur upper stage striking the crater Cabeus near the south pole of the Moon. Centaur impacted successfully on 9 October 2009, at 11:31 UTC. The Shepherding Spacecraft descended through Centaur's ejectate plume, collected and relayed data, impacting six minutes later at 11:37 UTC. The project was successful in discovering water in the southern lunar crater Cabeus. The NASA MESSENGER (MErcury Surface, Space ENvironment, GEochemistry, and Ranging) mission to Mercury launched on 3 August 2004 and entered orbit around the planet on 18 March 2011. Following a mapping mission, MESSENGER was directed to crash into Mercury's surface on April 30, 2015. The spacecraft's impact with Mercury occurred near 3:26 PM EDT on April 30, 2015, leaving a crater estimated to be 16 m (52 ft) in diameter. ^ Phil Davis; Kirk Munsell (23 January 2009). "Deep Impact Legacy Site: Technology – Impactor". Solar System Exploration. NASA / JPL. Retrieved 2009-04-22. ^ "Meteorite Found on Mars Yields Clues About Planet's Past". NASA. 10 August 2009. Retrieved 2009-09-08. ^ "Opportunity Status". NASA. Retrieved August 19, 2014. ^ NASA confirms contribution to Japanese-led Mars mission. Stephen Clark, Space Flight Now. 20 November 2017. ^ Yamakawa, Hiroshi; Le Gall, Jean-Yves; Ehrenfreund, Pascale; Dittus, Hansjörg (October 3, 2018). "Joint Statement with Centre National d'Etudes Spatiales (CNES) and German Aerospace Center (DLR) regarding Martian Moons eXploration" (PDF) (Press release). JAXA. Retrieved October 30, 2018. ^ Fujimoto, Masaki (11 January 2017). "JAXA's exploration of the two moons of Mars, with sample return from Phobos" (PDF). Lunar and Planetary Institute. Retrieved 23 March 2017. ^ "Chandrayaan first discovered water on moon, but?". DNA. Bangalore. DNA. Sep 25, 2009. Retrieved 2013-06-09. ^ Tompkins, Paul D.; Hunt, Rusty; D'Ortenzio, Matt D.; Strong, James; Galal, Ken; Bresina, John L.; Foreman, Darin; Barber, Robert; Shirley, Mark; Munger, James; Drucker, Eric. "Flight Operations for the LCROSS Lunar Impactor Mission". NASA. Ames Research Center. Retrieved 27 September 2011. ^ "NASA – LCROSS: Mission Overview". Nasa.gov. Archived from the original on 2010-05-05. Retrieved 2009-11-14. ^ Dino, Jonas; Lunar CRater Observation and Sensing Satellite Team (November 13, 2009). "LCROSS Impact Data Indicates Water on Moon". NASA. Archived from the original on 2010-01-06. Retrieved 2009-11-14.